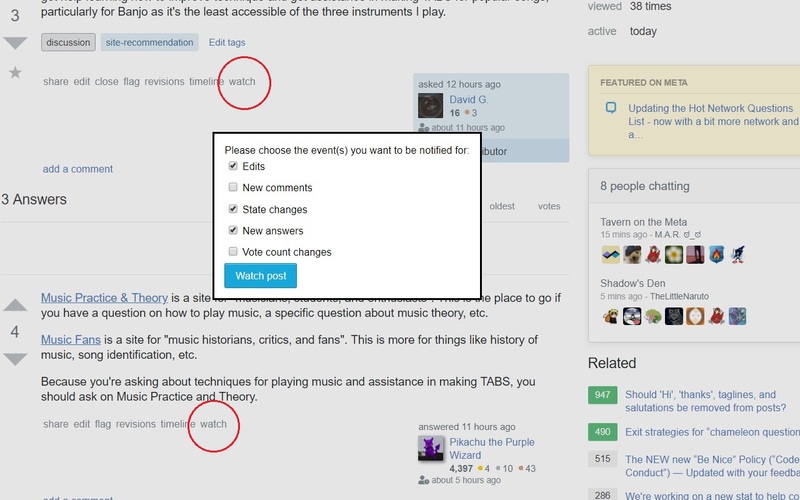 There has been some discussion about getting notified on comments to questions or answers that don't belong to you, and the long-standing wish to be able to keep track of new answers or developments in questions asked by other people. Please allow us to subscribe to Question/Answers. Can you notify question’s OP when any answer is commented? The general feeling - at least here on meta - seems to be against broadening the notification rules, out of fears of useless notifications to flood users' inboxes, turning SO into more of a discussion forum than it should be, etc. Here's a suggestion that would keep the user 100% in control what they get notified about, not generate any notifications by default, and require only minimal modifications to the User Interface. Each question and each comment area would get an envelope symbol. it is inactive (=white) by default. When those envelopes are hovered over, the tooltip says click to subscribe or something. When clicked on, the envelope lights up in green or some other colour (but different from the actual notification envelope's orange to avoid confusion.) You are then subscribed to any updates to that question or comment thread. For each subscription, you receive notifications in the "responses" tab, as if you were the owner of the comment or question. No further functionality, like managing subscriptions or anything, is necessary IMO. If the flood of notifications from a subscribed question starts to annoy you, you just open it and unclick the envelope. Done. You could subscribe to discussions you are interested in the outcome of, but don't want to participate in. It would (in my opinion) sort out a number of woes aired by many users in a good way, without adding annoyances to those who like the system just fine the way it is. It would not require a change in the visible layout. As far as I can see, the space the envelope would need to be is empty everywhere. I don't know SO under the hood of course, but technically, the system would be doing what it's doing already, notify question owners of updates - just that the circle of internal "owners" would grow. Ok, so this was largely implemented, albeit in a rather annoying fashion, via the notifications you got when a question you'd "favorited" was modified. But then came The Global Inbox (Eeek...), and that went away. There is a proposal to bring favorite notifications back, inboxified and meaner than ever - if you yearn to watch, peeping-tom-style, questions that are not your own, I would strongly advise you to up-vote this feature request. Note that comment notification is now flexible enough to automatically notify folks of responses to posts they've commented on in the most common scenarios (those involving a response from the owner of the post). "Subscribing" to comment threads is probably not going to happen, at least in the form described here - it would tend to encourage lengthy comment discussions, which we'd much rather bump into chat. In light of these events, and per Pekka's request, I'm marking this status-deferred - again, if you want to follow activity on a question, let your votes pour down upon this. I like it. It's flexible with good control but low complexity. Also, it helps deal with the fact that the mechanism that is supposed to tell me when someone comments with "@T.J. Crowder:" at the beginning (if I've commented before; there's a note about it here on meta from Jeff) doesn't work for my name, I'm guessing because of the dots. (I can't believe how many places screw up with assumptions about valid characters in names. The dots also mess up SO's user search.) So if I think follow-ups are likely, I can subscribe to comments on the answer and be more helpful to people. But I've wanted this for a while now, even absent the issue with the auto-notification. This is completed -- if you favorite a question, you will be notified of any activity within it. This would be an incredibly useful feature for letting us know when a post we've downvoted has changed so we can change our votes, or when a question is clarified so we can post an answer and help the OP. If this were to be implemented, it would also be nice to be able to specify what specific changes we care about (e.g. only new comments, or if the question was closed), so we can filter out unnecessary notifications. I know one of the concerns in the past for having a notification feature like this is that there would be too many notifications for us, so this would help reduce the number a lot! 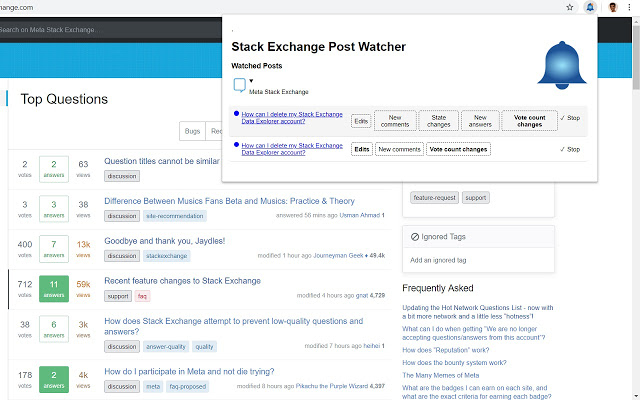 This feature was requested in SOX a while ago and I've made an extension for Chrome and Firefox that lets you watch posts for any specific changes on posts you want to follow. It uses a similar idea to the OP and adds a 'watch' button (instead of an envelope) to the actions under every post on the network, letting you keep track of edits, vote changes, post state changes (e.g. closures), new comments, and new answers. You can find out more from the Stack Apps post or the Github repo. If you want to give it a shot you can install from here for Chrome or here for Firefox! Not the answer you're looking for? Browse other questions tagged feature-request status-deferred comments answers notifications . 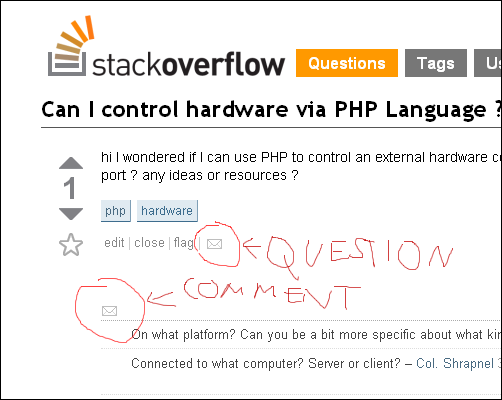 How can we follow answers here via Stack Overflow itself? Is there a way to get notification on Stack Overflow?